A crisp, clear semi-gloss film with an ultra-low-melt adhesive system and UV inhibitors. For ink jet, plain paper, and photographic prints, DigiGuard UV Satin provides enhanced clarity and ink preservation. It’s suitable for single- or double-sided application, providing added rigidity and protection from abrasions, moisture, oils, and dirt. Its satin finish maintains rich, full colors while reducing glare and reflection. It exhibits excellent adhesion and consistent roll uniformity. 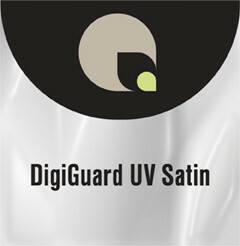 DigiGuard Satin is available in widths up to 76”. When images are ink jet printed, our Quality Satin Paper and Ink Jet Coated Media have been specially designed to work with DigiGuard Satin for superior end results.